In 2015/2016, there was an unprecedented bloom of a single-celled plant called Pseudo-nitzschia in ocean waters, which resulted in elevated levels of domoic acid in Dungeness crab and rock crab. The elevated levels of domoic acid in crab along the West Coast impacted California fisheries from Santa Barbara to the Oregon Border. The conditions that support the growth of Pseudo-nitzschia are impossible to predict, but tend to be more common in the warmer months of the year. Crustaceans, fish and shellfish are capable of accumulating elevated levels of domoic acid in their viscera and muscle tissue. Domoic acid was discovered in California in 1991. Shortly after, in 1993, the California Department of Public Health (CDPH) initiated its marine biotoxin monitoring program and now, through a network of volunteers, routinely collects phytoplankton and bivalve shellfish samples from a number of sampling sites along the coast year-round. As elevated levels of domoic acid are identified in bivalve shellfish in a particular area, additional species (anchovies, sardines, crabs, lobster, etc.) are sampled and analyzed for domoic acid content. CDPH coordinates with the California Department of Fish and Wildlife (CDFW) to collect pre-season Dungeness crab samples each fall from representative locations along the coastline. This pre-season monitoring ensures that Dungeness crab do not contain elevated levels of domoic acid when the fishery opens. Last year, CDPH found elevated levels of domoic acid in Dungeness and rock crab along a large portion of the California coastline. When CDPH finds that crab contain a level of domoic acid in the viscera that exceeds the federal action level, a health advisory is issued to notify the public of the risk of consumption. The 2015/16 season was also unique in that it was the first year that CDPH isolated domoic acid from the meat of both Dungeness and rock crab. Continued harvest of crab with elevated levels of domoic acid from an area under advisory and offering those crab for sale puts the fisherman and subsequent distributors and retailers in violation of the law. During the 2015/2016 event, the Office of Environmental Health Hazard Assessment, in consultation with CDPH, determined that the fishery should be closed for both recreational and commercial fishing in order to avoid potentially serious human health impacts. A recommendation to close the fishery was initiated by California state health agencies when Dungeness crab viscera or meat exceeded the action level. The agencies involved have reviewed the 2015/16 event and evaluated options for handling future events. While an event of this magnitude is unlikely to occur very often, state agencies plan to prepare a response in case another event occurs. The agencies plan to discuss options and hear additional feedback and ideas from the Dungeness crab industry later this month. Read more about preparations being made for future events in the full version of the multi-agency memorandum Domoic Acid Background and Potential Option for Future Events. Visit the Ocean Protection Council website for information regarding opportunities to join the discussion. The California Department of Public Health (CDPH) issued a health advisory warning individuals to avoid eating rock and Dungeness crab due to the detection of high levels of domoic acid. 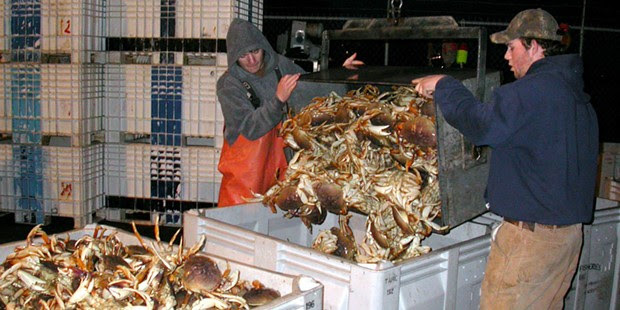 The advisory was followed by a recommendation from the Office of Health Hazard Assessment (OEHHA) to the California Fish and Game Commission and the California Department of Fish and Wildlife (CDFW) to delay the start of the Dungeness crab season and close the rock crab fishery. These actions would apply to each fishery from the Oregon border to the southern Santa Barbara County line. Domoic acid is a potent neurotoxin that can accumulate in shellfish, other invertebrates and sometimes fish. It causes illness and can cause death in a variety of birds and marine mammals that consume affected organisms. At low levels, domoic acid exposure can cause nausea, diarrhea and dizziness in humans. At higher levels, it can cause persistent short-term memory loss, seizures, and can in some cases be fatal.